Recipes for Brick BBQs :: Veggie :: Barbecued Portobello Burgers. 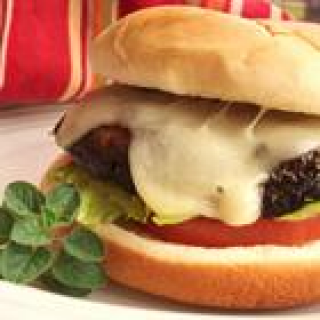 HomeRecipes for Brick BBQsVeggieBarbecued Portobello Burgers. Place the mushroom caps, smooth side up, in a shallow dish. In a small bowl, whisk together vinegar, oil, basil, oregano, garlic, salt, and pepper. Let stand at room temperature for 15 minutes or so, turning twice. Light your Black Knight barbecue and brush grill with oil. Place mushrooms on the grill, reserving marinade for basting. Grill for 5 to 8 minutes on each side, or until tender. Brush with marinade frequently. Top with cheese during the last 2 minutes of grilling.